The benefits of STEM education are vast. 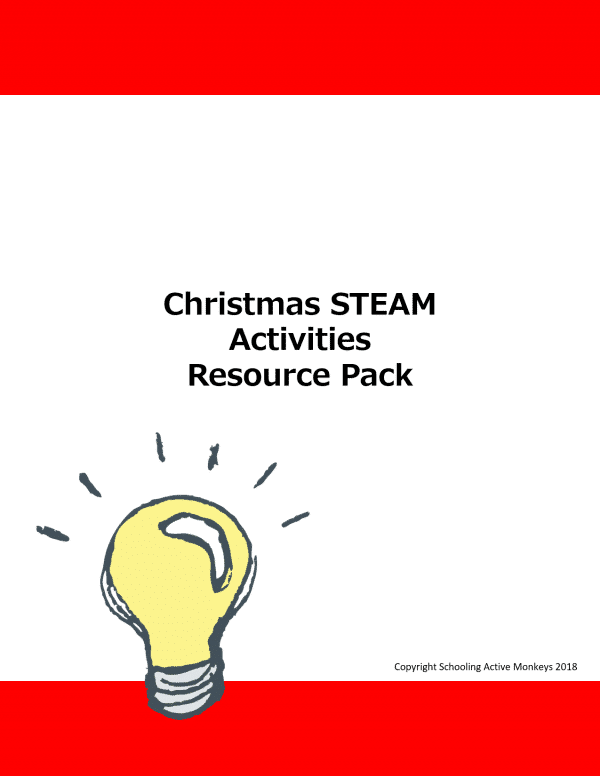 Make teaching STEM even easier with the Holly Jolly STEAM Resource Pack! The Holly Jolly STEAM Resource Pack offers a companion printable set to the Holly Jolly STEAM Activity e-Book. Filled with printable resource cards, additional STEM challenges, and support to make doing STEM activities even easier! This resource pack is designed to be used with the Holly Jolly STEAM Activity e-Book. You will be directed to the download page. Click “Download: Holly Jolly Resource Pack” to save your printable. You will also be sent an e-mail link to download your printable. Print as many copies of the PDF printable as you need for your family. Do not distribute the pdf file. Instead, send friends to Schooling a Monkey to download their own copy. Print your e-book onto computer paper or read the book on a phone or tablet. Print the resource pack onto cardstock paper. Laminating the resource pack cards will offer greater durability.